Jay and Mark Duplass, otherwise known as the Duplass Brothers, have long skirted around the periphery of my cinematic awareness. I’ve known their names and had a basic grasp on their approach to filmmaking, without ever delving into their output. That was until I read Jason Tanz’s fantastic Wired articleabout the pair. It’s a terrific read and left me inspired to finally give the pair their dues. A quick VOD search found that I had easy access to three Duplass Brothers movies; Jeff, Who Lives at Home (which they wrote and directed), The One I Love (produced by their shared production company, Duplass Brothers Productions, and starring Mark), and Creep (co-written by, produced by, and starring Mark). So, why not start at the beginning . 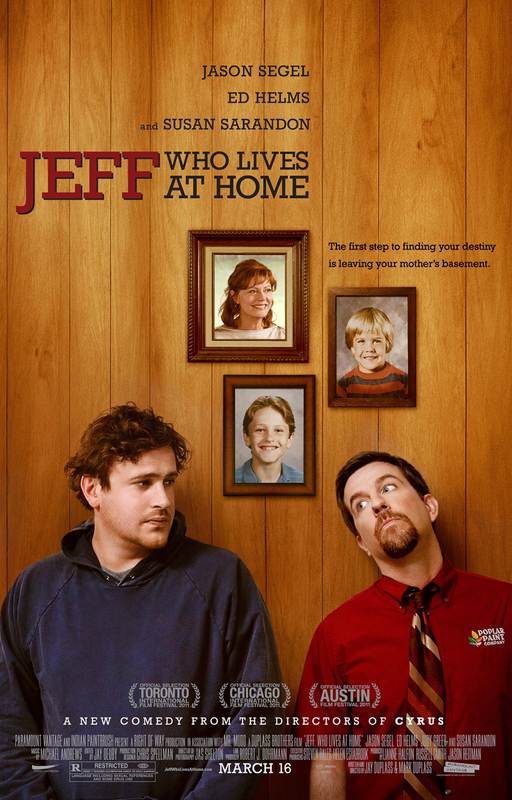 . .
2011’s Jeff, Who Lives at Home was the brothers second studio feature. It upped their budget considerably from their early independent projects. But, with great power comes great responsibility, and the film consequently bombed at the box office with $4.3m domestic. However, while the film failed commercially, it hits the mark in pretty much every other way. Following an overtly indie set-up, the movie follows the three remaining members of the Thompkins family; mother Sharon (Susan Sarandon), and her two adult sons, still-living-at-home, Jeff (Jason Segel), and moderately more ‘successful’, Pat (Ed Helms). Jeff sees a bewildering phone call as a sign of his ultimate destiny, Pat’s marriage (to the always excellent Judy Greer) starts to crumble after he indulges himself with a Porsche, and Sharon finds herself the target of a secret admirer. All three strands are given their screen time, but the real magic happens between the narrative lines. What the Duplass Brothers offer here is an antidote to the mean-spirited ‘midlife’ crisis drama of Noah Baumbach’s Greenberg. It’s a movie made by optimists, by a pair of filmmakers who believe in people. Even Pat’s douchey Porshce-love is atoned for. It helps, of course, that his materialism is silenced by the reveal that the object of his desire is far from infallible. The human relationships, on the other hand, are seen to be far more resistant. The lead players are also all on great form. Segel delivers yet another deeply sympathetic ‘waster’ lead, but it’s Helms who’s the real revelation. Known primarily for infantile comedy performances, Helms is given arguably the most dramatically charged role and he stands his ground brilliantly. He’s aided by the Duplass’ tonally astute writing. Never veering too far into overly manufactured drama or comedy, and handling any moments of magical-realism with ease, the film comes across as disarmingly true. On this evidence, I have to say the Duplass Brothers are shaping up – or have shaped up, if their other films continue on this trajectory – to be two of the 21st century’s great cinematic humanists. I’ve got The One I Love queued up already . . .